This entry was posted in Manchester and tagged Algernon Swinburne, blossom, cherry blossom, poet, Wordless Wednesday on April 12, 2017 by Bec - views from my garden bench. 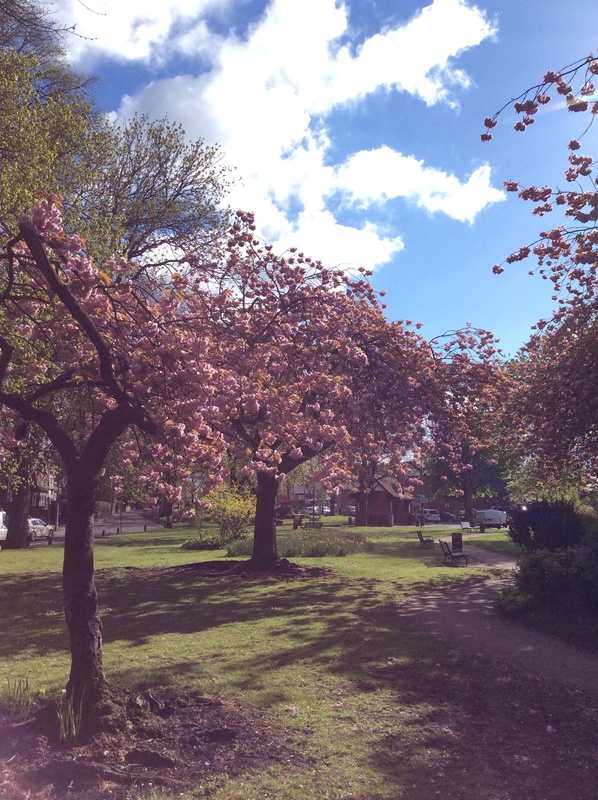 This entry was posted in Manchester and tagged blossom, cherry blossom, monton, parks on April 29, 2015 by Bec - views from my garden bench. It’s glorious sunshine in Manchester today, I decided to feature tulips again in my vase on Monday (Yellow and purple ones last week). These three reminded me of ripe cherries and raspberry ripple ice cream. This could be because I’ve got holidays on my mind. We’re off to Cornwall on Saturday for a week – I am so excited! I went last September (2014) for the first time in nearly 30 years. We had a wonderful time, especially at the Eden Project, so we’ll be going back there, the ‘Lost gardens of Helligan’ and the beaches too. Heaven! 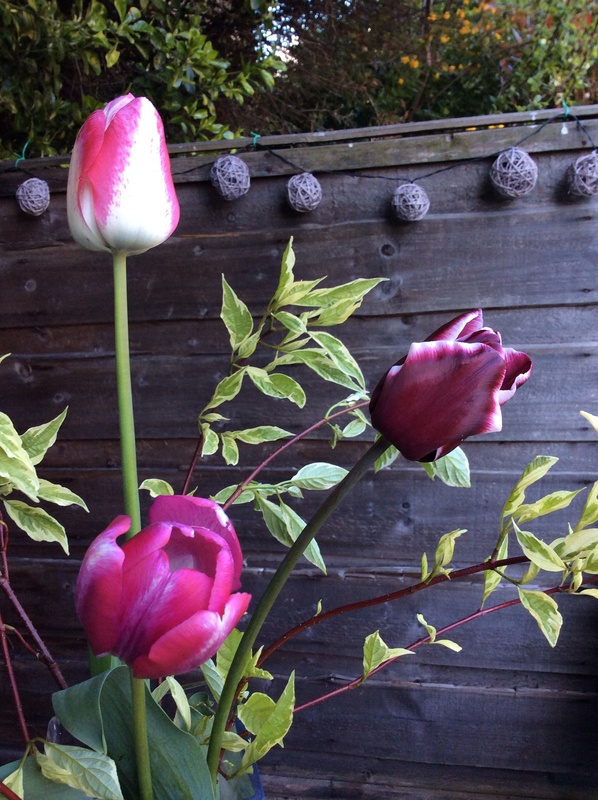 These tulips were planted last autumn – I’ve mentioned before how much I like purple. These came from Wilko’s but as usual, I’ve got no idea what they’re called. The dogwood (Cornus) is a variegated one with red stems in the winter. It’s at the end of my garden and pokes out between a row of conifers in my neighbour’s plot . It hangs over into our garden; so we prune it, so it doesn’t poke me in the eye when I’m gardening. Dogwood is easy to grow but it definitely needs pruning for it to be at its best; it spreads though if it’s left and the old wood doesn’t have the glorious stem colour. There are loads of varieties including ones with yellow stems, it’s very common in gardens here in the UK because of it’s all round interest and its hardy. I liked the contrast of colours with the purples, pinks, greens and whites. 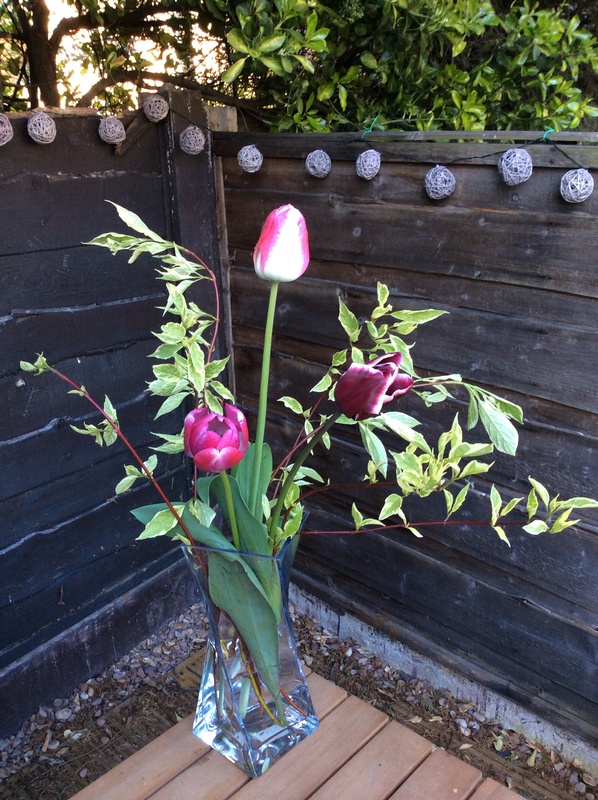 Also thought too much foliage would overwhelm the tulips. I’ve used the same vase last week as I haven’t got any other tall thin ones – though I think The Chap might be bringing something home from work for me. We had a good day in the garden yesterday after a very hectic few weeks. I rearranged my strawberry plants, put a dwarf raspberry in a larger pot and put the tumbling tomatoes in hanging baskets. Also I tidied up all the fuscias in pots we’d over wintered in the garage and thought about what I’d put where. A bit of TCL for my cosmos seedlings too – fingers crossed they survive us going away. And The Chap put up the solar lights up too – we’ve eaten out in the garden 9 times so far this year. The other things I’m enjoying this week are the wonderful blossom on the cherry, apple, hawthorn tree – they look incredible this year. There are many around where I live, as it’s full of Victorian houses and mature gardens. I’ve only got room for two dwarf apple trees in pots in my garden but I’d love more. The blossom is really brighting my drive to and from work; I really must get out and take some photos this week as they’ll be gone soon. 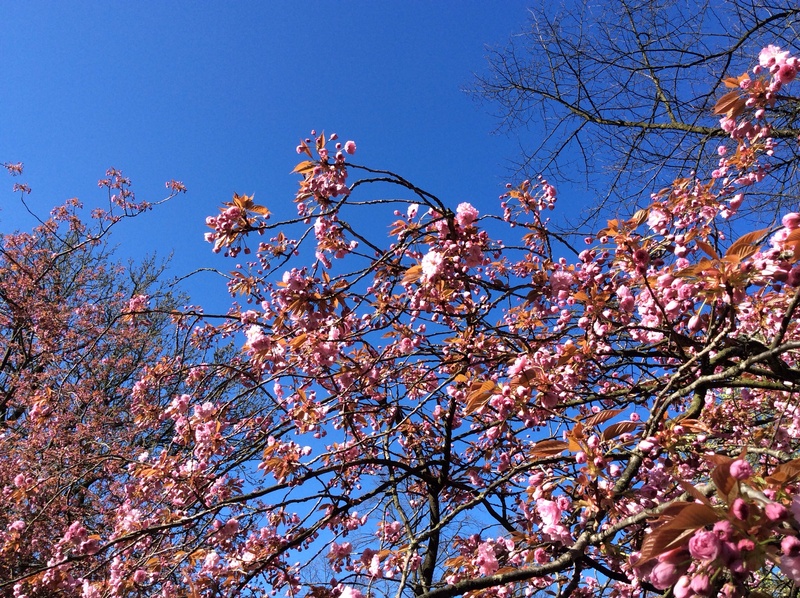 Cherry blossom – 26 April 2015 – NO FILTER!! www.ramblinglinginthegarden.wordpress.com. She’s got a wonderful selection of vases this week and is celebrating her 1000th blog post – I’m a very long way off that milestone. It’s great to see what people are growing around the world. What plants have you enjoyed this weekend? Or have you been to Cornwall? Any suggestions where to go? 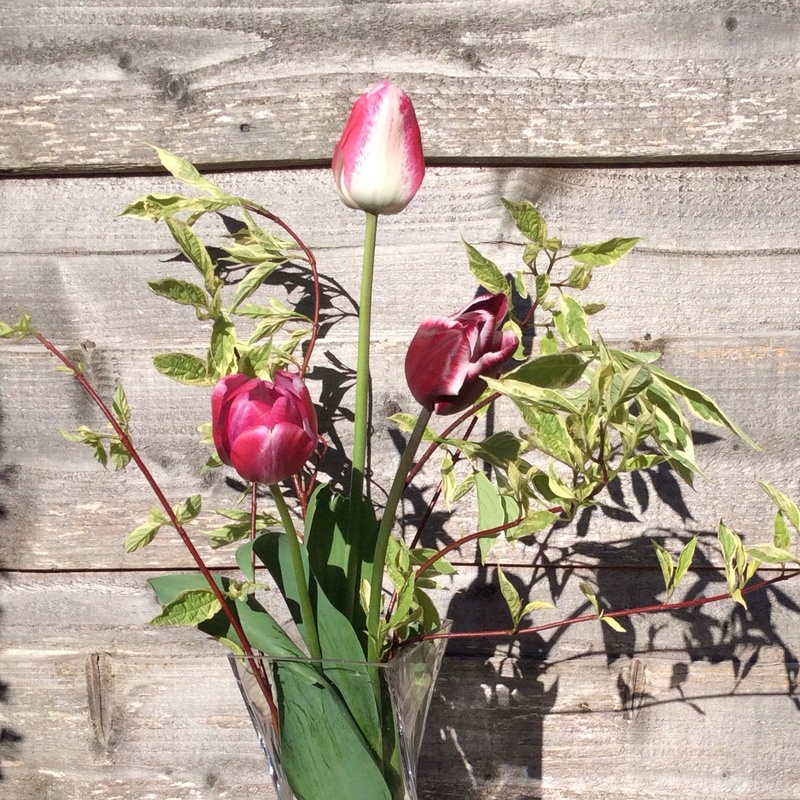 This entry was posted in Gardening, In a vase on Monday and tagged blossom, bulbs, dogwood, Gardening, holiday, In a vase on Monday, solar lights, Tulip on April 27, 2015 by Bec - views from my garden bench.